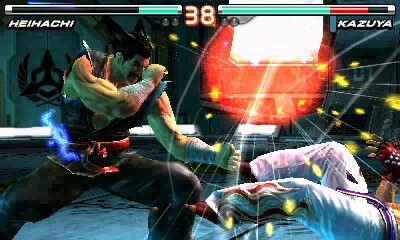 REVIEW: Tekken appearing on a Nintendo system might induce unpleasant memories of Tekken Advance... which is by far the worst port of Tekken ever to be released. Thankfully, handheld systems have significantly advanced since 2001, and Tekken for the 3DS is, at the least, a solid port. 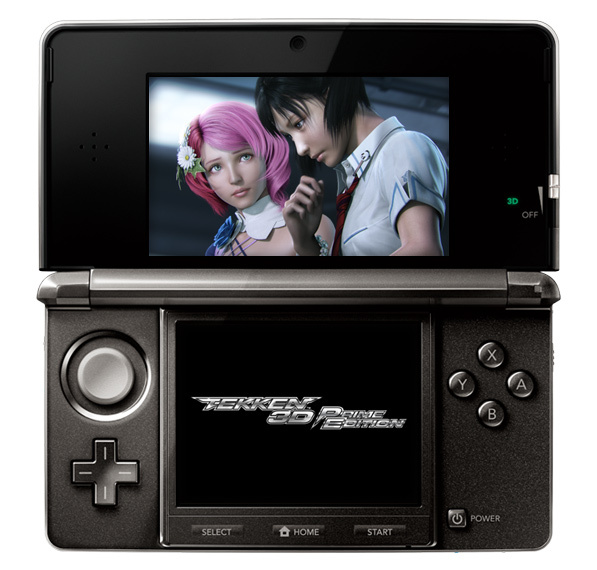 Namco saw the 3DS as an opportunity to present the series in a new light, and perhaps to a new audience. 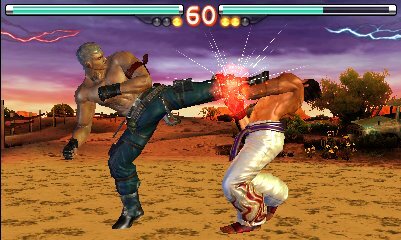 Tekken 3D: Prime Edition features what some would call a port of Tekken 6, complete with 40+ characters, and a stereoscopic 3D version of last year's CG film Tekken: Blood Vengeance... all on a tiny 3DS cartridge! Finally..... Tekken has come back... to Nintendo!! 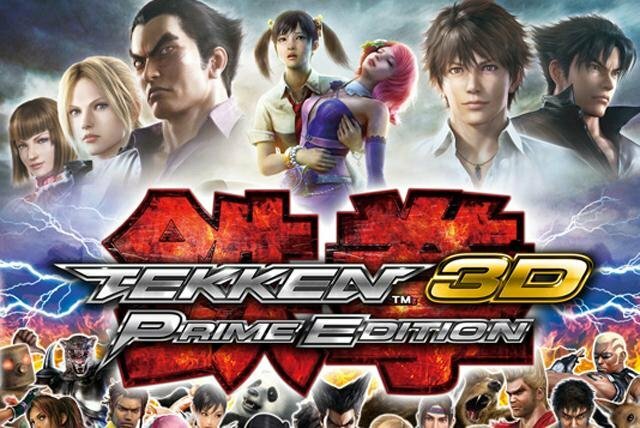 Tekken 3D: Prime Edition's character lineup mirrors the dynamic Tekken 6 roster. The stylish new character selection screen shows off crisp high-resolution character artworks, complete with cool 3D effects. As far as movesets go, characters haven't lost anything from their Tekken 6 iterations, but unfortunately haven't gained anything either. The only exception is "young" Heihachi, who actually uses his Tekken Tag Tournament 2 moveset (complete with new animations and a new win pose). As a semi-decent Heihachi player, I definitely enjoy using the new version of him... he has about 10-15 new moves and a few new combo possibilites. However, being able to use TTT2 Heihachi only makes me wish all the characters in the game were based on their most recent TTT2 versions... because then this game could be taken a bit more seriously. With that said, the game itself is definitely light on content. First of all, there's no opening movie or intro whatsoever. There's also no story element in the game... so no character prologues, epilogues, or endings. 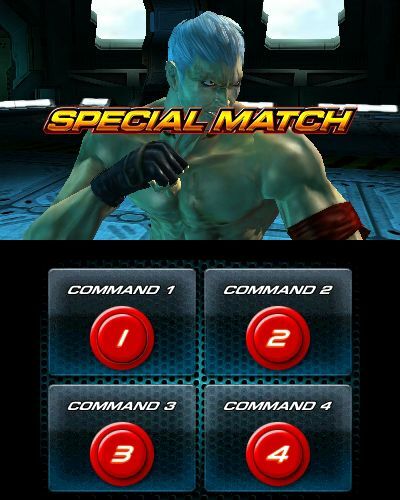 The main mode selection is limited to Special Survival, Quick Battle (basically an arcade mode), Versus Battle, Online Mode, and Practice. Special Survival is a mode that pits you against either 5, 10, 20, 40, or 100 opponents in a row. It's also ridiculously easy on the default setting... the computer AI just seems to get hit by everything. It's easy to connect and fight against other players worldwide through the Wi-Fi enabled Online Mode, but it is generally pretty slow and laggy from my experience. I've managed to have a few halfway decent matches, but I see little reason to play this online since I have a PS3 at the ready 99% of the time. The game actually looks a lot better in person... 2X better at least! 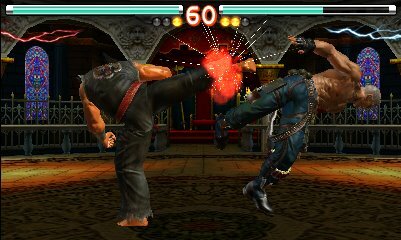 Visually, Tekken 3D: Prime Edition is actually one of the best looking titles on the 3DS to date. 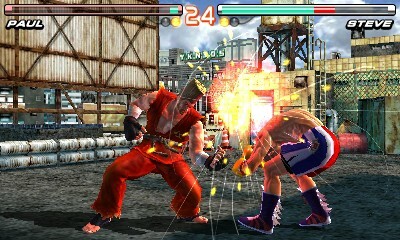 The game runs at a silky smooth 60 frames per second even with the 3D effect turned on, which is something that other previous fighting games on the system could not support. 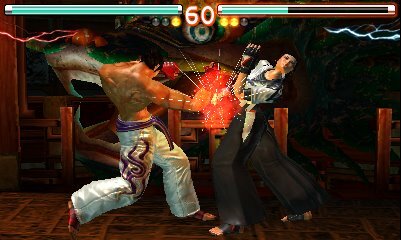 The stereoscopic 3D effects actually look pretty cool with Tekken's gameplay, notably during those hard-hitting throws when the camera zooms in. The new backgrounds in the game also appear to be designed to give the illusion of "depth" to compliment the 3D effect, and most of which look great. Unfortunately, a few stages borrowed from Tekken 6 didn't translate very well. Stages like Lightning Storm and Urban Warzone are strangely "black & white," which almost seems like a shoddy attempt to cover up their obvious lack in detail. 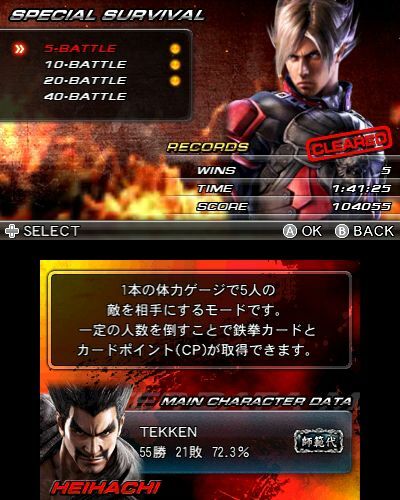 Comparatively to the PSP version of Tekken 6, the stages definitely look better on Sony's system, by far. Ironically enough, the character models, clothing detail and textures are actually sharper and more detailed on the 3DS! The 3DS version had the chance to "one-up" the PSP version with a replay feature, but unfortunately, there are no replays on 3DS either. In continuation, the PSP version has a "softer" appearance while the 3DS version is crisper, but due to the superior stages & spark effects on the PSP, I have to give the edge to the PSP version in graphics. 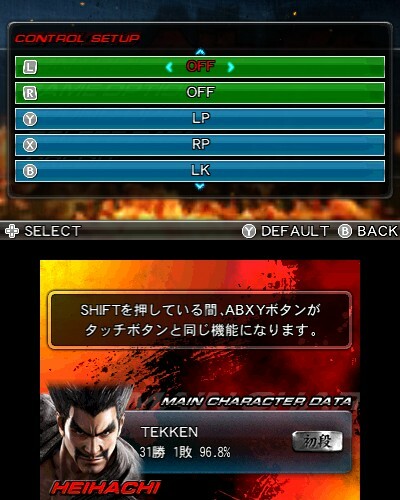 Additionally, the D-pad and buttons on the PSP are undoubtedly more suited for Tekken, especially since they mimic a PS3 controller, which is the controller of choice for many Tekken players (including myself). 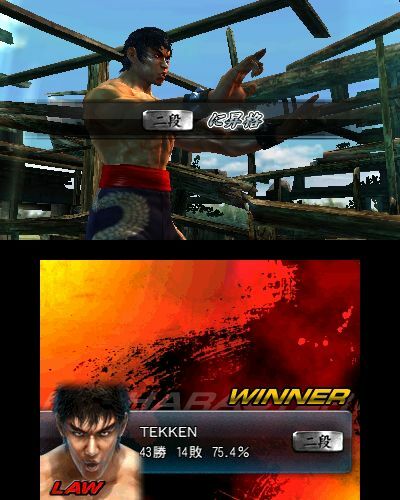 In fact, I can actually play a semi-serious game of Tekken on the PSP, but that's definitely not the case on the 3DS. The 3DS's directional pad isn't as bad as I thought.... Quarter circle moves and basic combos aren't too difficult to pull off (and by "basic" I mean 7 to 10 hit combos). I also seem to be able to perform consecutive EWGFs a lot more often than I expected to, so that's a plus! Diagonals are sometimes hard to find, but you can get used to it. 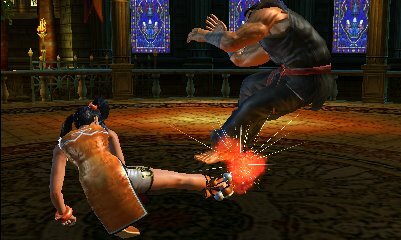 However, advanced movement techniques like Wave Dashing and Backdash Canceling will never feel natural on the 3DS d-pad. 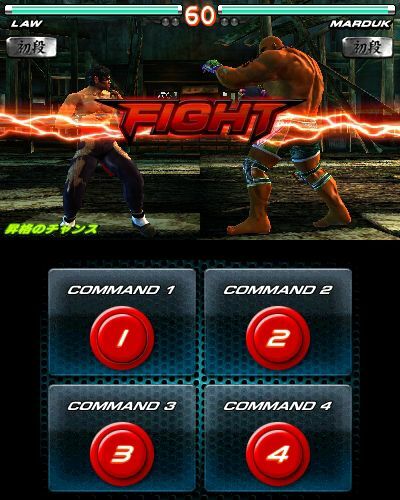 The fast-paced nature of Tekken's advanced movement system simply wasn't made for a generic D-pad... and don't even think about using the 3DS circle pad to play Tekken (because that's just silly). 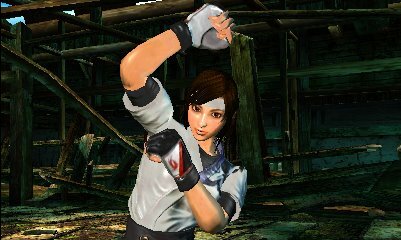 As I expected, the use of the 3DS circle pad actually feels more natural in games like DOA: Dimensions and SSF4: 3D Edition. However, if you play Tekken on a beginner or casual level, you probably won't mind the control setbacks as much (but keep in mind, it's not going to help you improve your game). 60 fps with 3D effects turned on!? Eat that Capcom & Tecmo! 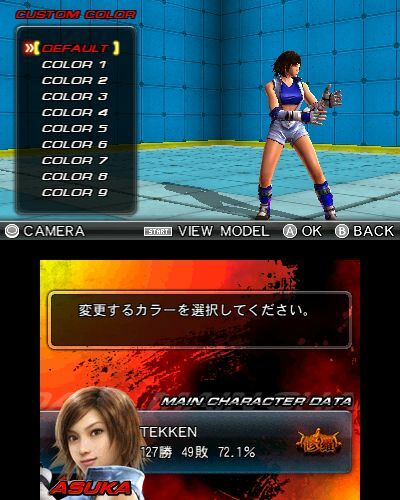 Tekken 3D: Prime Edition features a Customization Mode, but it only allows you to change the color schemes of characters. Furthermore, it takes a hell of a lot of work to unlock colors... you actually have to rank up to "Master" or "Rogue" before unlocking any! Also, you can't customize the placement of character colors like you can in other games... you can only unlock pre-set color schemes. It's even more lame when you consider that all colors were available from the start on PSP & console versions of Tekken 6... not to mention tons of customization items. 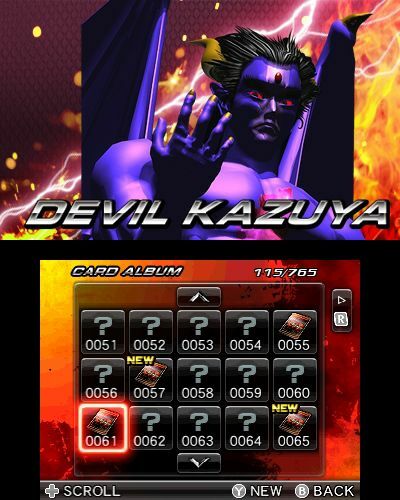 The final mode is called "Tekken Cards," which allows you to keep track of and view up to 700 unlockable trading cards in the game. 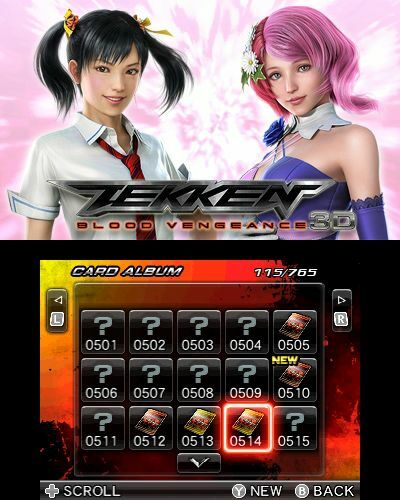 The cards feature memorable scenes & characters from the Tekken series, and can be viewed in 3D. 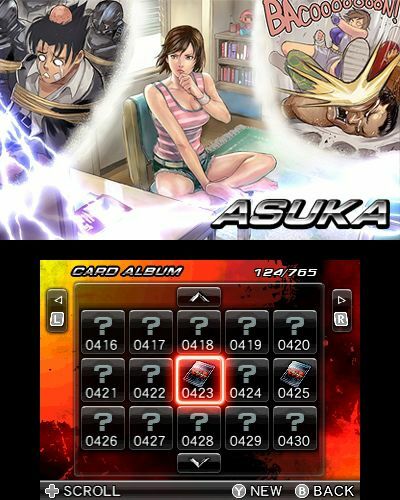 A few of the artworks that appear on the cards I actually haven't seen myself (and aren't on the site), so there is some incentive for Tekken fans to unlock these cards. 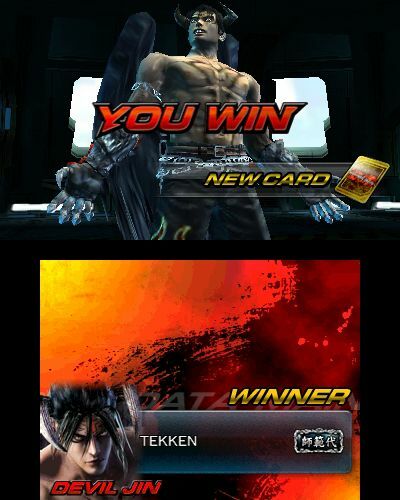 However, most of the cards appear to be the typical sliced-up character artworks from previous games, Blood Vengeance screen grabs, and old school renders which never fail to induce laughter. Cards are unlocked by playing through the game's various modes, by using the 3DS's StreetPass feature, or by using 3DS Play Coins. It's kinda fun unlocking cards, but as the lone bonus mode of the package, it's definitely not as satisfying as a full Customization Mode or Theater. 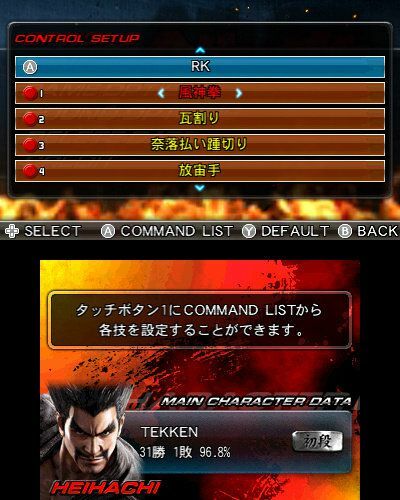 Finally, like most of the other fighting games on the 3DS, Tekken 3D: Prime Edition features touch screen controls. 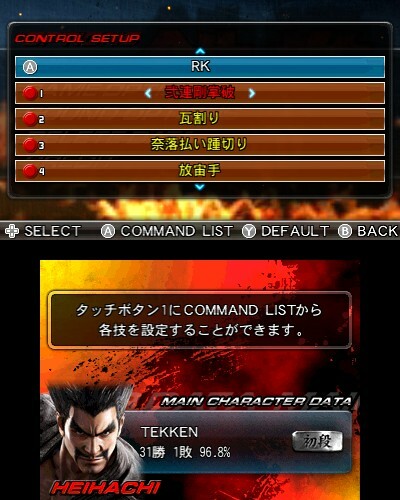 You can actually customize a unique control scheme for each individual character, with 4 touch screen boxes at your disposal. By default, there are 4 different special moves mapped onto the touch screen for each character. Additionally, depending on the directional movement you input before tapping the command, you can usually end up performing some different moves as well (good for the hopeless noobs I guess). Of course you can also set the touch screen to enable throws, or various multiple button presses like the LP+RP+LK+RK Aggression Charge... which does come in handy considering the 3DS's control scheme limitations. It's a halfway decent and "cute" little package, but Tekken 3D: Prime Edition pales in comparison to other portable Tekken releases. There's not much in the way of "new" for the seasoned Tekken player, and the presentation of the game is very rushed. 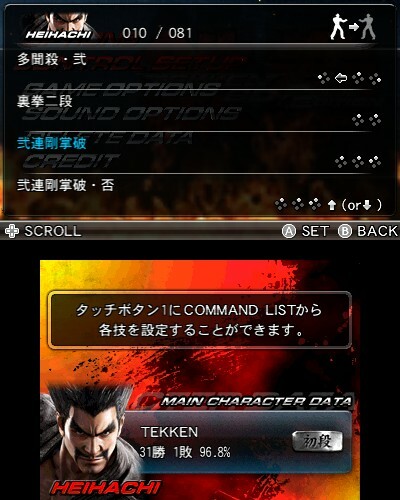 There are some new BGM tracks and new stages to enjoy, but otherwise, most of the content in Prime Edition can be found in other iterations of Tekken. You have to wonder.... If Namco didn't include the movie on the cartridge, what else could they have added to the actual game? I'd prefer seeing character endings & prologues/epilogues over the movie... but since Tekken: Blood Vengeance debuted as a 3D film a few months back, it was the obvious fit. My thoughts on the movie can be found in my Tekken Hybrid review... and on that note, having a 3DS version of the same movie that I already own on Blu-Ray is kinda pointless. Also, the movie doesn't allow you to switch to Japanese audio, and I really can't stand the English voices. Some Tekken characters just really shouldn't speak English.... ever. Click Here for all screenshots!